Great is the descriptive term I use because other terms like “best” are comparison terms. Comparison to others. Or something else. Great, in the context I mostly use, is only in comparison to yourself. It’s your greatness. And your greatness has nothing to do with anybody else. Or anything else. It belongs to you. It’s your responsibility. That doesn’t’ mean others can’t contribute to helping you. They can. And do. Who we surround ourselves with matters! The people we allow in our lives make a big impact. For good. Or bad. Growing is my verb of choice because it’s present tense, just like the title verb I use, GROW. It’s a now verb. It doesn’t care if you failed yesterday. Or if you’re planning to do something different tomorrow. Do it now. Yes, I want to encourage you to keep doing it, but right now is all we have. Let’s make the most of it. Growing great isn’t for wimps because wimps spend time comparing themselves with others. Cowards won’t grow great because they’re busy feeling better about themselves by putting others down. Or by choosing lower standards of comparison. It’s judgmental and foolish. So I’m really supposed to feel good because I can single out somebody who is suffering, or less fortunate, or has had fewer opportunities? That doesn’t sound like the path toward growing great. Cowards won’t grow great because they’re busy feeling worse about themselves by exalting others. Sometimes our cowardice isn’t judgmental in the negative sense. Sometimes we’re busy admiring others and excusing our own lives. It’s jealousy. Envy. It fosters bitterness, but it comes at the price of feeling badly about ourselves. If we were only as lucky as them? Or as educated? Or given the breaks they were given? Then we’d be great, too. Wimps won’t grow great because they’re not able to see themselves accurately as they continue to gauge their lives by how others are doing. Put any guitar in Mark Knopfler’s hands and he’s a master. Put a guitar in my hands and I’m not even able to successfully fret a chord. He spent years learning, playing and practicing the guitar. I’ve spent years listening to guys and gals like him play. It’s an unfair comparison. But when young Mark was learning guitar, a younger me was learning about sales, marketing and operating business. We both love the guitar, the comparisons of our lives are completely worthless. Growing great isn’t for wimps because wimps spend time wearing a mask. Sure, we all want to put our best foot forward. We want others to admire us. Sometimes the masks are necessary, if not downright helpful. I’ve met with people or stood in front of a group and not felt at my best. I don’t stand up and make an honest declaration, “I really don’t much feel like talking to you people today. I didn’t get much sleep last night. So I just want you folks to know that right now, I’d rather be just about anywhere other than here.” I may feel like that, but that won’t help me, or them. So I grind it out. So do you. That’s hardly hypocrisy, but it is a mask of sorts. Then there are other masks that aren’t helpful. Or honest. But we want to impress people. So we often misrepresent ourselves with embellishment, keeping that chinstrap tight on our mask. We can’t afford to have our mask inadvertantely, or intentionally knocked off. It’s our everything. And it’s wimpy. Fake it ’til you make it might have some degree of validity if you ever made it. But the practice of faking it mostly supersedes the activity and behavior necessary to make it. Old habits can be crazy hard to break. Faking it is a habit. Growing great isn’t for wimps because wimps won’t intentionally and purposefully surround themselves with people who can help them grow. Wimps prefer people who will support them or sympathize with them no matter what. Wimps enjoy the company of people who will feel sorry for them. People who will listen to their excuses without challenge. Wimps do this because in the short-term it feels good. We enjoy getting sympathy. The problem is it’s unprofitable over time. It doesn’t serve us, except at the surface level. It’s superficial. 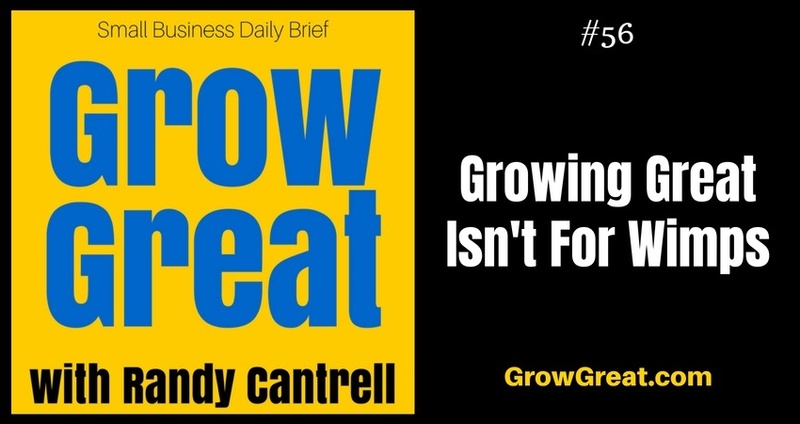 Growing great isn’t for wimps. It’s for the bold, audacious, adventurous and courageous. It’s for people like you. Why else would you be listening to a podcast with a title, Grow Great? Business leaders – bold, audacious, adventurous and courageous leaders – willing to grow great (or to grow greater) are willing, even anxious, to put in the work. There are some things they know that others haven’t yet learned. What others have, or do, has no bearing on their performance, leadership, business or lives. That knowing what they’re good at – potentially great at – is unique and not dependent on the strengths of others. That putting themselves in the company of people with whom they can be completely transparent is vital to their growth. We all need people who won’t judge us without our mask. How willing are you to step up so you can give yourself bigger opportunities to grow great? You’ll grow older no matter what you do. You may as well spend that time growing great.